Featuring a smooth, polished chrome finish with clean, horizontal lines, the MOEN Rizon Single Hole 1-Handle Bathroom Faucet will offer a sophisticated, elegant look in your bathroom. Its modern style features simple edges and soft curves that work well in smaller baths or powder rooms. Its low arc spout keeps your sink splash free. Aplos Single Hole 1-Handle Mid Arc Bathroom Faucet in Chrome with Lever Handle Complete your bathroom with this new, all-around useful piece from Kraus. You'll enjoy the easy use and modern design of this single-control faucet. Make your sink look even more beautiful with this item's easy-to-install deck mounted design. This faucet is WaterSense certified so it uses less water and energy. Aplos Single Hole 1-Handle Mid Arc Bathroom Faucet in Chrome with Lever Handle is rated 4.4 out of 5 by 20. 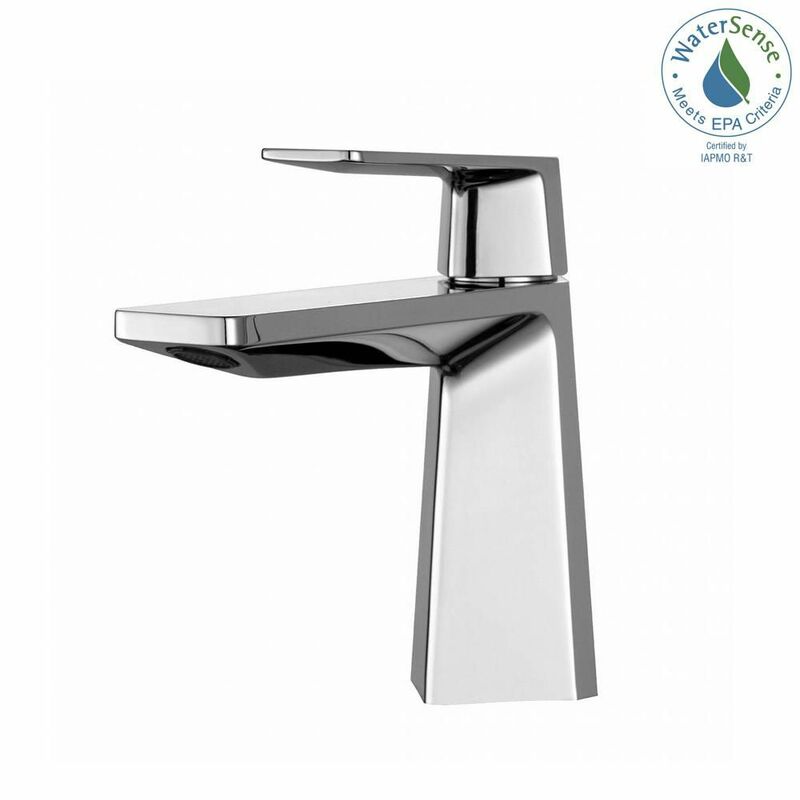 Rated 5 out of 5 by Wein from High Quality Faucet ! Satisfied with this purchase ! High quality n looks great ! Rated 4 out of 5 by Laura from Stunning, but the chrome smudges very easily.... Stunning, but the chrome smudges very easily. Rated 1 out of 5 by UncleFrog from I ordered this faucet and thought it looked amazing. I should have looked more carefully and rea... I ordered this faucet and thought it looked amazing. I should have looked more carefully and read more reviews, but I just wanted to warn anyone else out there so they don't order this mistakenly as well. None of the pictures show the drain knob in the back of this faucet! Only one shows the hole for the knob. I purchased this for the sleek look, and the intrusion of the drain knob sticking out ruins the whole look of it, making it look like a $40 product. After I started looking at the spec sheet and installation instructions to see what I might need to install it, that is when I saw the drain and knob assembly. This is NOT *clearly* stated on any of the descriptions (at this point). I had already purchased a popup drain as well. The vendor needs to address this misrepresentation! Rated 1 out of 5 by Teef from Very dissatisfied! Water comes out in about a 1/4" stream and strong; splashing all over the pla... Very dissatisfied! Water comes out in about a 1/4" stream and strong; splashing all over the place. Thought it was the aerator. Removed it and found it to be clean. Plunger on back is very hard to keep adjusted properly. I'm tired of crawling under the sink to put it back together! Premium price, looks good, works horribly. Rated 2 out of 5 by pitor82 from Looks really nice, however, the quality of the parts are... Looks really nice, however, the quality of the parts are not the best. Had to get new washers in order to install without a leak. I would not recommend this to a friend. Rated 5 out of 5 by kmichaelp from Stunning Elegance and Top Quality Functionality The Kraus Aplos Single Hole Single Handle Bathroom Faucet has strong dimensional lines in combination with superior quality and craftmanship. Initially, you are struck by it's beauty. Once you have used it, you are captivated it's quality. In two words, "Absolutely stunning!" Rated 5 out of 5 by kmichaelp from Stunning Elegance with Top Quality Functionality The Kraus Aplos Single Hole Single Handle Bathroom Faucet was the perfect choice for our corner, glass top sink sink with floating cabinet. The faucet has strong dimensional lines in combination with superior quality craftmanship. Everyone who seen and used this faucet in our guest bathroom has remarked and commented on its beauty and functionality. In two words, "Absolutely stunning!" Does it come with a base plate for a 4&quot;/3 hole sink? HI Shaz, Thanks for your inquiry. No, this faucet does not include a base plate, however, many retail partners do carry them in a variety of sizes and finishes.